This is a brand new service available for patients from out of state, who can fly in and leave with a full set of teeth on the same day of their visit. 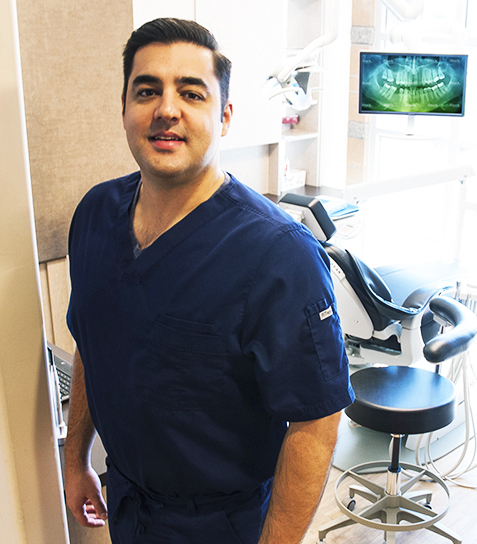 “Our lab is equipped with the latest dental technology and robotics and is one of the very few labs in the world that can offer All-on-4 procedure with full restoration in one single day,” says Dr. Pourshirazi. Phoenix based dentist and world expert in dental implants, Dr. E. Pourshirazi, is now excited to offer a one-day procedure, known as All-on-4, to patients from out of state who are typically not good candidates for conventional implants. Dr. Pourshirazi’s state-of-the art facility with latest in dental technology makes it possible to complete the procedure and final restoration on the same day of the visit. All-on-4 solution is an implant-supported custom created prosthesis, secured with a minimum of 4 dental implant s and precisely placed in the areas of the jaws with the most bone volume. Patients receive a natural and custom designed set of teeth that are secured to the dental implants on the same day. These implants are fully functional at the time of placement. With Dr. Pourshirazi's onsite facility, he is able to create a custom prosthesis in form, function, and esthetics for each individual patient. A custom-prepared treatment protocol, including utilization of digital x-rays, 3D cone beam CBCT imaging, intraoral scanner, and advanced milling capability--all done on site--helps to shorten the process in receiving custom dental appliances, ensures quality to the highest standard, and greatly reduces the likelihood for errors found in high-volume labs. Along with the positive psychological and emotional impact, the All-on-4 procedure encourages and improves the oral health and prevents further bone degradation in the areas where the implants are placed. With one of the most advanced implant bridges currently on the market, the Prettau Zirconia Bridge, used in All-on-4 implant restoration, the rewards for the patients are nothing less than a life changing experience.